OBJECTIVE: The purpose of this case report is to describe the chiropractic management of a child with abnormal fixation of one eye and torticollis. CLINICAL FEATURES: A mother presented with a concern regarding her 23-month-old son who had a history of torticollis and an abnormal fixation of the right eye. She noticed the head tilt when he was about 7 months old and abnormal alignment of the right eye when the boy was 18 months old. At 15 months when he took his first steps, his head tilt became worse. At 21 months old, a neurological and orthopedic examination at the regional university children`s hospital ruled out presence of a tumor of the cervical spine or posterior fossa. The orthopedist sent the baby for chiropractic evaluation and treatment. Chiropractic exam found decreased active and passive range of motion in the cervical spine and no evidence of mass or contracture of the sternocleidomastoid muscle. Segmental palpation showed a decreased joint play and pain reaction at level C1/C2 on the right. INTERVENTION AND OUTCOME: The chiropractic treatment consisted of spinal manipulative therapy of the cervical spine in addition to massage and stretching of the neck muscles. Within a period of 4 weeks (3 chiropractic treatments) the torticollis was nearly resolved and the abnormal fixation of the right eye was no longer apparent. 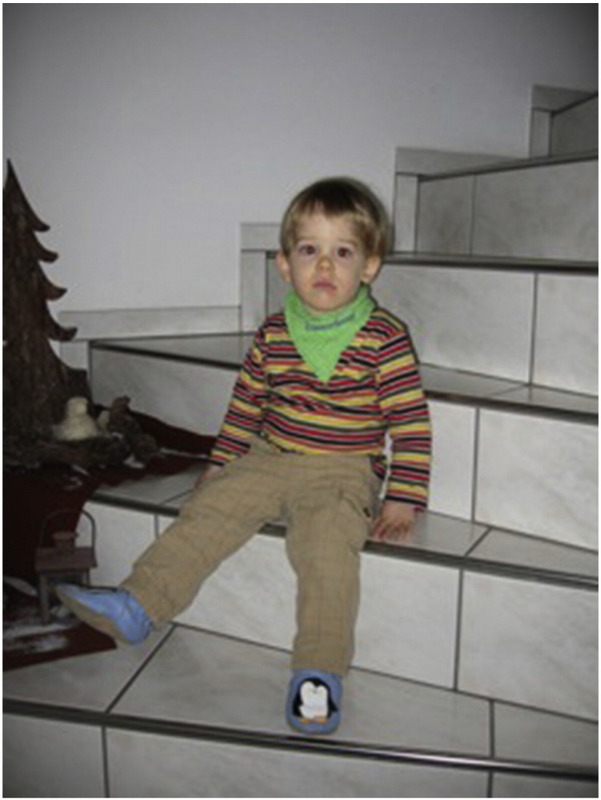 No relapse of the symptomatology was observed at a follow-up consultation at 26 months. CONCLUSION: The patient responded favorably to chiropractic care, showing a possible mechanical spinal cause for his torticollis and for the secondarily developed abnormal fixation of the right eye. The reported prevalence of congenital muscular torticollis with a tumor in the SCM has ranged from 0.3% to 2%. The prevalence of muscular imbalance and dysfunction in the craniocervical junction causing torticollis is unknown. The prevalence of the non-musculoskeletal causes of torticollis in children is unknown. Ballock (1996)  studied 288 subjects with a mean age of 22.7 months and found that non-musculoskeletal causes of torticollis accounted for 18.4% of the total. Of all the non- musculoskeletal causes 22.6% had ocular etiology. Another study, a prospective consecutive case series from 2005,  investigated the prevalence of different causes of torticollis in children presenting to primary care pediatricians. Of the 29 patients below the age of one year, 19 had orthopedic etiology, 4 ocular and 6 unknown problems. This is a small number of patients, but is, however, the only prospective study done on the prevalence of torticollis in infants. There is a paucity of literature investigating or reporting on the chiropractic management of ocular torticollis in children. Therefore, this case report presents a case where abnormal fixation of one eye developed as a secondary complication to torticollis. Although the case report is of a low level of evidence, it is not without value,  and it is the best way to share rare observations. Ethical considerations were considered and this case report includes pictures, with permission from the parents, to help illustrate the case. Written informed consent was obtained from the parents for publication of this case report and the accompanying pictures. A mother with her 23–month-old baby, who had a history of non-resolved torticollis, consulted the author, a chiropractor in a private clinic. The boy is the first child of a married couple with an uneventful antenatal history. The mother gave a non-assisted spontaneous birth in week 38 + 0 in the local hospital. Birth weight was 3000 grams, length 47 cm. Except for minor jaundice, the results of the postnatal examination were excellent. Fussiness and crying were present at night for the first few months, otherwise he was a healthy boy with normal developmental milestones. The head tilt was noticed by the mother when the boy was about seven months old. The head tilt was to the left, with a rotational component to the right. She informed her pediatrician, but he saw no reason to investigate further. Pictures of the child as young as 4 weeks of age seem to show this head tilt could have been there at this age (Figure 1). At 15 months, he took his first steps; the head tilt became worse. In addition, the mother had noticed abnormal alignment of the right eye and she consulted a pediatric ophthalmologist when the boy was 18 months old (Figs 2 and 3). The ophthalmologist noticed that the boy`s right eye was adducted, when looking straight ahead, but made no any abnormal findings in his examination, which included a careful examination of the extra-ocular movements. When the boy was 21 months old, a neurological and orthopedic examination was made by specialists at the regional university children`s hospital during which the presence of a tumor of the cervical spine or posterior fossa was ruled out. At the hospital, radiographs were taken of the cervical spine, with no relevant findings. The orthopedic examination showed a decreased range of motion (ROM) and there were no findings on the palpation of the SCM. The orthopedist sent the baby for chiropractic evaluation and treatment. On the chiropractic examination, a head tilt to the left with chin rotated to the right, a right parietooccipital plagiocephaly with ear shift, frontal bone prominence and facial scoliosis were present. There was a slight right convex curve in the mid thoracic spine. Abnormal fixation in of the boy's right eye (the eyes were not aligned; the right eye was adducted) was noticeable when he was looking straight ahead. He had a decreased active and passive ROM in the cervical spine, which is listed in Table 1. All cervical muscles were palpated with no evidence of mass or contracture of the SCM. With segmental palpation a decreased joint play and pain reaction was observed at level C1/C2 on the right. The treatment comprised spinal manipulative therapy (SMT) C1/C2 on the right using a diversified technique, with minimal rotatory components, modified for a child. In addition, the baby was given regular physiotherapy comprising massage and stretching of the neck muscles. Within 4 weeks (3 chiropractic treatments) the torticollis was almost gone, with a slight residual left lateral head tilt. Active and passive ROM of the cervical spine was full in all directions. The abnormal fixation of the right eye was no longer apparent (Figure 4). An ophthalmological examination by the same ophthalmologist confirmed a resolution of the fixation problem. No relapse of the symptomatology was observed at a chiropractic follow-up consultation at 26 months. A slight head tilt is only to be seen when the child is very tired. In this case, the author found an unusual secondary functional deficit caused by musculoskeletal torticollis with a dysfunction in the craniocervical junction. 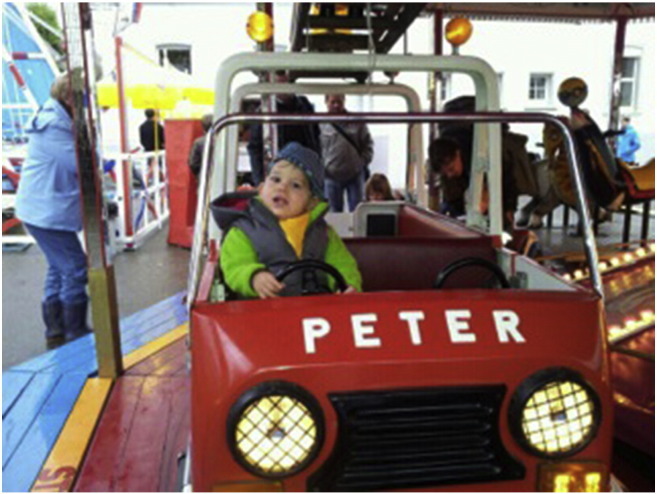 The little boy showed abnormal fixation of the right eye, which appeared to be due to untreated torticollis. The evidence for this is that the careful examination made by the pediatric ophthalmologist ruled out a true strabismus before and after the chiropractic and physiotherapy treatment. In addition, the torticollis resolved after the musculoskeletal treatment, which would probably not have been the case in true ocular torticollis. Further, the torticollis demonstrated lateral flexion and contralateral cervical rotation, which is classic for musculoskeletal torticollis. In contrast, in cases of torticollis due to true ocular pathology, the infant will often show lateral flexion of the head,  but without head rotation in the opposite direction. Studies on ocular torticollis after eye surgery [7, 8] show improvement or spontaneous remission of torticollis usually. In the author`s experience, chiropractic and physiotherapy treatment in true ocular torticollis provide little improvement. An extensive literature search by the author in PubMed and Google Scholar located no studies on that problem. There were no studies at all to be found on the effect of SMT of non-musculoskeletal torticollis. The treatment with SMT (adjustment) was successful in this case because it restored the full range of motion of the cervical spine and the torticollis resolved. Before the treatment, the right rotational position of the torticollis caused the boy's right eye to adduct to improve his vision or strengthen his binocular vision. The treatment outcome endorses a spinal mechanical cause of the torticollis, which caused the abnormal fixation of the right eye. The torticollis in this case report was discovered late or disregarded. It is hypothesized that this child would not have developed a fixation problem of the eye had the torticollis come to resolution earlier, at least prior to sitting upright. It is also suspected that this condition would not have resolved on its own over time, since there was no easing of the condition with the child’s development. It seemed to worsen rather than ameliorate with time. Children are brought to the chiropractor as the first health care provider for torticollis. For our profession, as for other primary health providers, it is a major challenge to differentiate between musculoskeletal and non-musculoskeletal reasons for infantile torticollis. The actual prevalence of different causes of torticollis is unknown and difficult to estimate because infants with neurological, ocular and orthopedic causes are referred to and treated by different health care providers. A good prospective study of prevalence would be possible only in a multi-disciplinary, multi-year setting. Since chiropractors specialize in musculoskeletal health, we should be able to rule out other systemic diseases, and try to differentiate musculoskeletal from non-musculoskeletal reasons for torticollis. This is also true for ocular problems causing torticollis or abnormal fixation of one eye due to torticollis. To detect any deviations from the norm, the normal development of vision in an infant should be well understood by the chiropractor. The eyes of a newborn are closed most of the day. Newborns cannot coordinate their eye movements and can focus only at a distance of 20–30 cm. They can fixate on an object only for a few seconds, and they move their heads to move their eyes. Six-week-old infants should have some response to their parents, or examine faces. 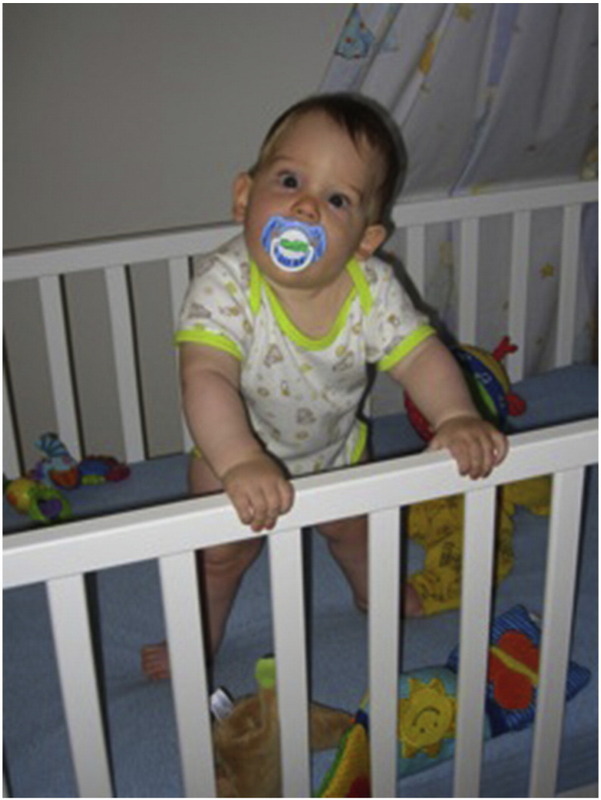 By about two months of age the infant should be able to fix and follow an object. At this age they start to move their eyes independently of their heads. Their eyes are becoming aligned and they can follow people and objects. During the first three months of life it is normal for an infant to display intermittent horizontal strabismus. Strabismus is considered intermittent if it occurs from time to time, or is present only when the child looks in a particular direction (left or right, for example). Intermittent strabismus should resolve completely by three months of age. In addition to the musculoskeletal exam, a cursory eye examination should be performed. An example of a 4–step screening examination for infants [11–13] is listed in Table 2. This screening-examination is, by all means, cursory and do not include examinations like Parks-Bielschowsky three step test, cover, cover-uncover test and alternate cover test since extensive experience is needed to perform these tests on an infant. The screening examination should help the chiropractor to decide when to refer the child to an ophthalmologist. This case report is limited to only one patient, thus the results cannot be extrapolated to others. This case report cannot prove that the abnormal fixation of one eye was due only to the torticollis with a dysfunction in the craniocervical junction. Further studies are required to understand secondary complications of torticollis and how to treat them and further studies on differential diagnoses and the prevalence of musculoskeletal and non-musculoskeletal reasons for torticollis are required. Additional studies are also needed to investigate the effect of SMT on musculoskeletal and non-musculoskeletal torticollis in infants. The patient responded favorably to chiropractic care, showing a possible mechanical spinal cause for his torticollis and for the secondarily developed abnormal fixation of the right eye. This highlights the awareness of secondary functional and structural deficits of torticollis and of non-musculoskeletal causes of torticollis, especially ocular causes. The author thanks Dr. Cynthia Peterson and Dr. Damien Mauron for their review and comments and Dr. Joyce Miller for her encouragement and helpful suggestions while preparing this case report. This case report constitutes part of the requirements towards a Post-Graduate Master's degree in Advanced Professional Practice (Paediatric Musculoskeletal Health) at Anglo European College of Chiropractic, Bournemouth. Physiotherapie in der Pädiatrie; pp. 429–430. Kinderorthopädie in der Praxis; pp. 117–120. Cheng J.C.Y., Wong M.W.N., Tang S.P., Chen T.M., Shum S.L.F., Wong E.M.S. Clinical determination of the outcome of manual stretching in the treatment of congenital muscular torticollis in infants: A prospective study of eight hundred and twenty-one cases. The prevalence of nonmuscular causes of torticollis in children. Nucci P., Kushner B.J., Serafino M., Orzalesi N.
A multi-disciplinary study of the ocular, orthopaedic and neurologic causes of abnormal head postures in children. Williams C.R.P., O`Flynn E., Clarce N.M.P., Morris R.J.
Torticollis secondary to ocular pathology. Effect of strabismus surgery on torticollis caused by congenital superior oblique palsy in young children. How to write a case report for publication. Infants from birth to three; do you see what they see? Bell A.L., Rodes M.E., Kellar L.C. Gortner L., Meyer S., Sitzmann F.C. 4th ed. Manuelle Therapie bei Kindern; pp. 253–254.